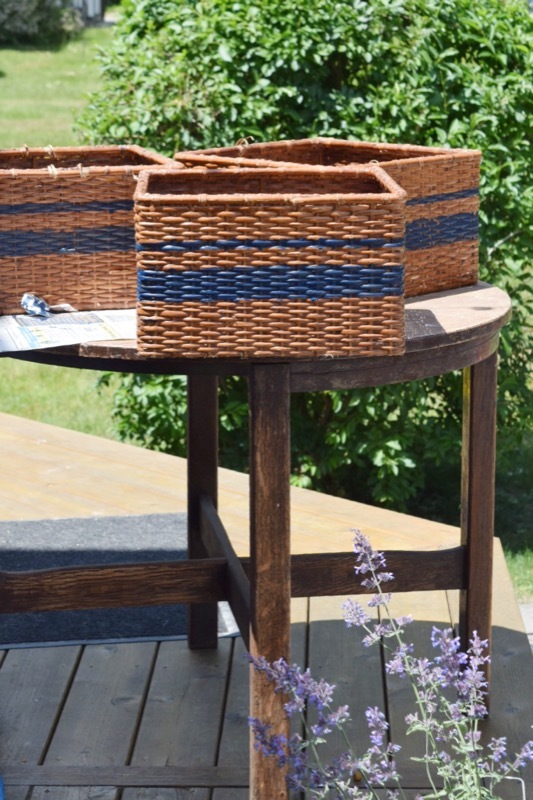 Pottery Barn does not need to be re purposed, up cycled or hacked! I agree! 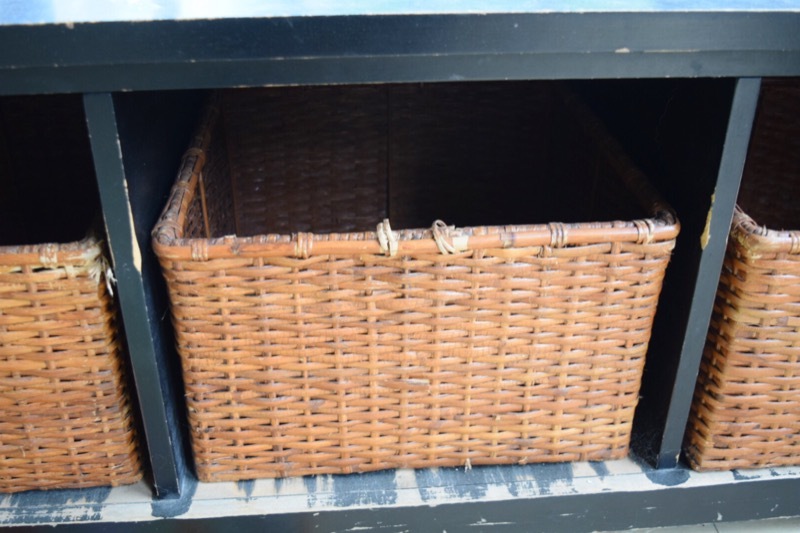 Everything from Pottery Barn is close to “decor perfection”, so why on earth would you want to hack it? 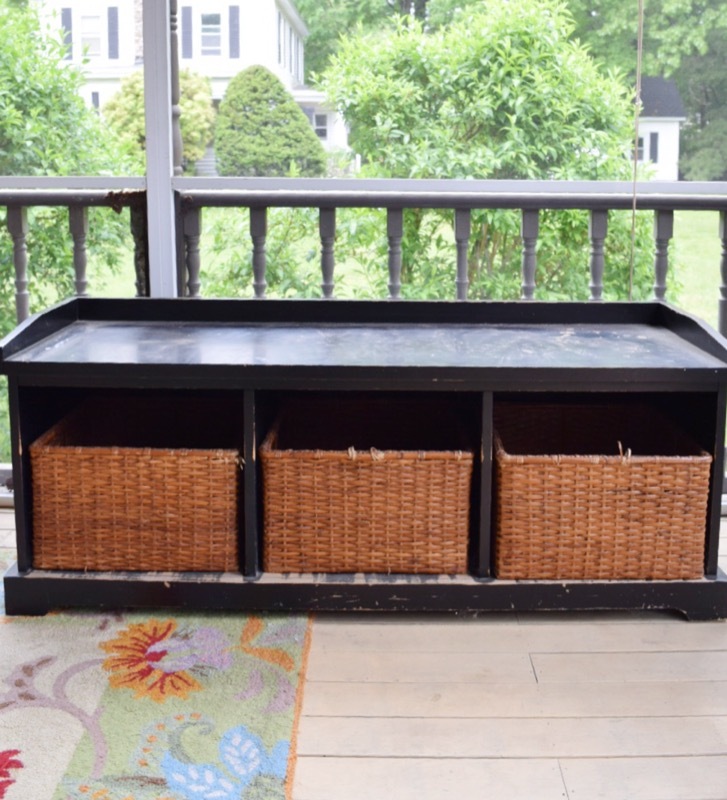 I bought this bench for our mudroom 12 years ago!! Three puppies later ( a favorite chew toy for all), and a variety of shoes that called this home for my three kids, and it has aged! 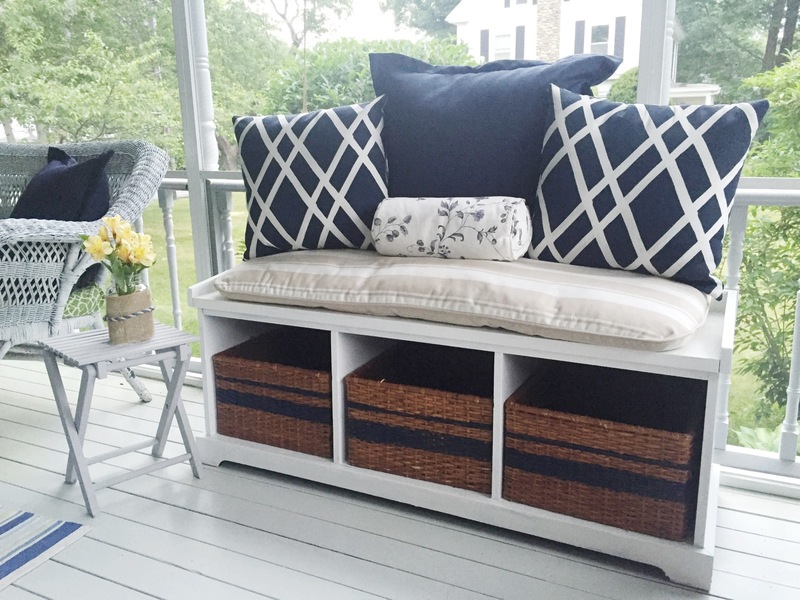 When we moved into our current home, the mudroom was so small that this bench just took up too much room. And my boys’ shoe size has grown so much that only one pair of sneakers fit it their basket! So, I retired it to the basement hoping I would find a place for it! My husband built me a table out of an old door and I needed a bench! So, I dragged this up from the basement, and decided it needed a facelift if it was going to be at the table. I brought it outside and painted it white. I primed it, then gave it two coats. 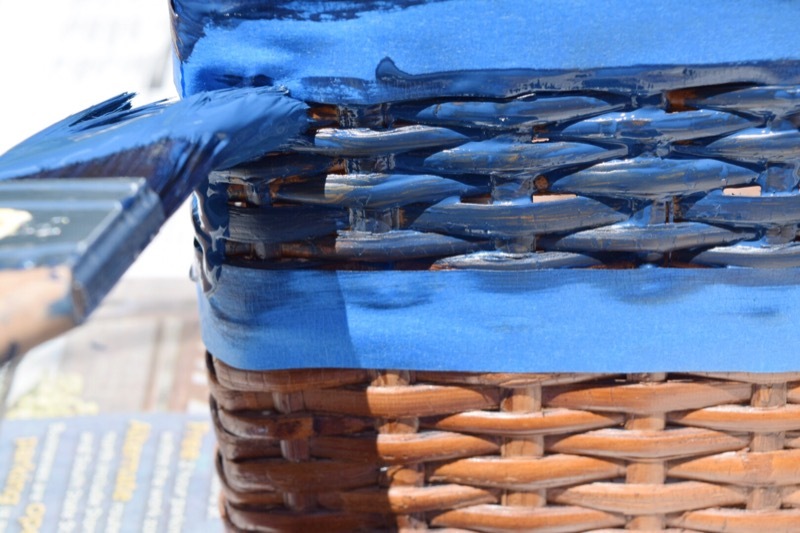 It was going to be on my screened it porch and it will get a lot of use, so I decided to try sealing it in the same product we used on the floor. 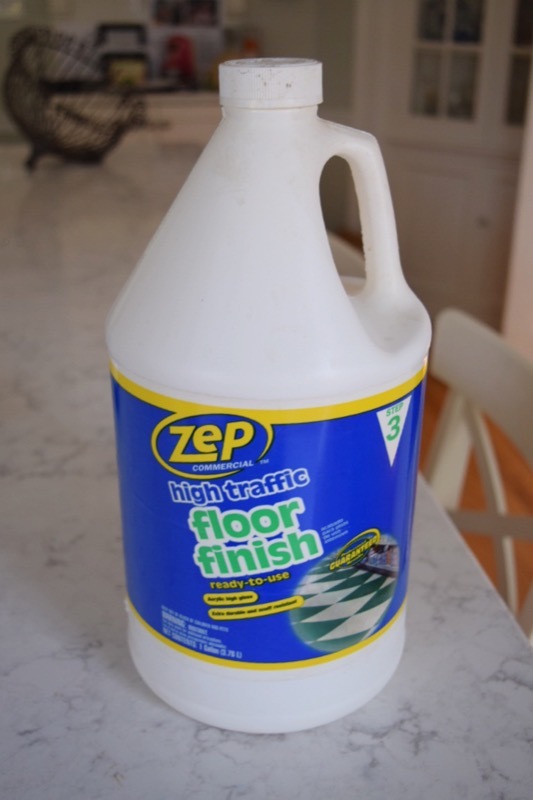 This product works awesome on a deck and for my porch floor! It is super weather resistant and prevents scratches! 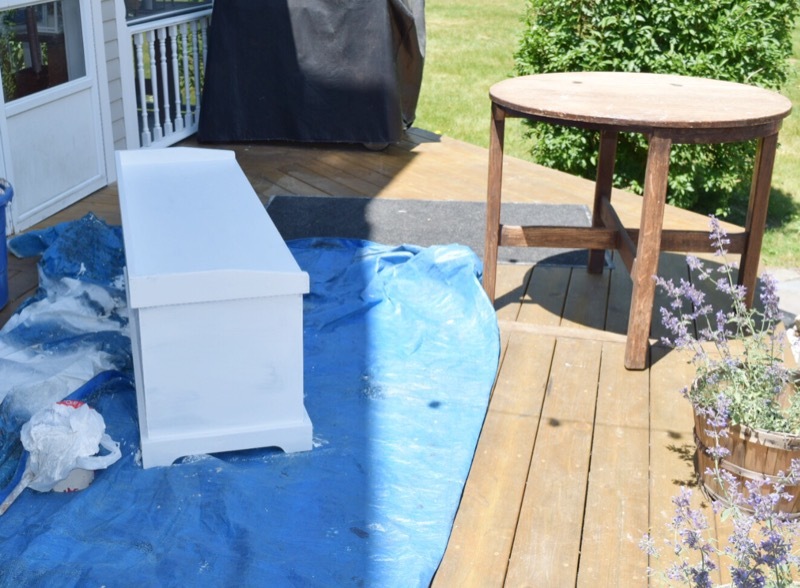 I covered the bench with two coats letting about 30 minutes of drying time between each coat. They need a facelift too! 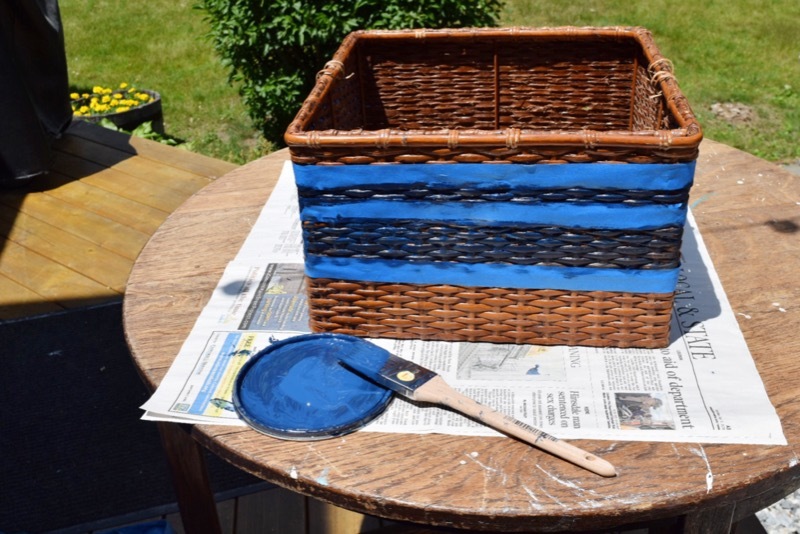 I love navy stripes and I thought painting the baskets would be a good idea. I just used painters tape, to tape off my lines. I didn’t measure, I just eyeballed it! 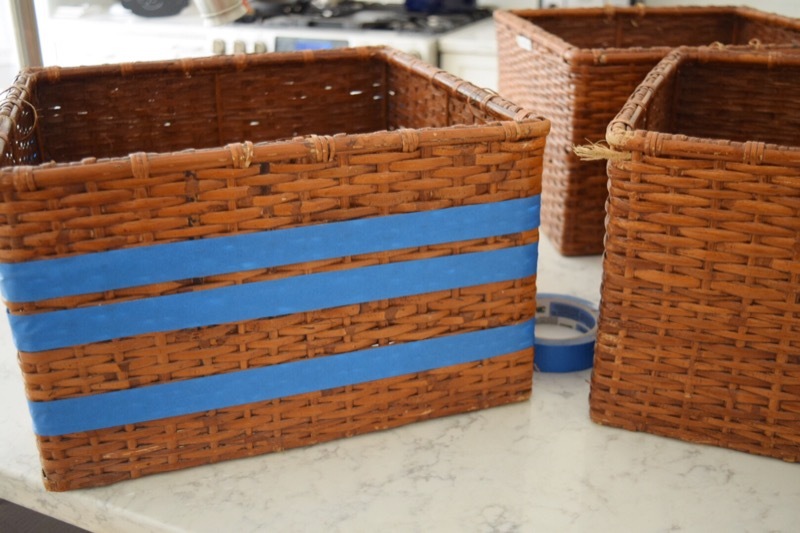 After I taped off the first basket I lined them up and did the same with the other two baskets. 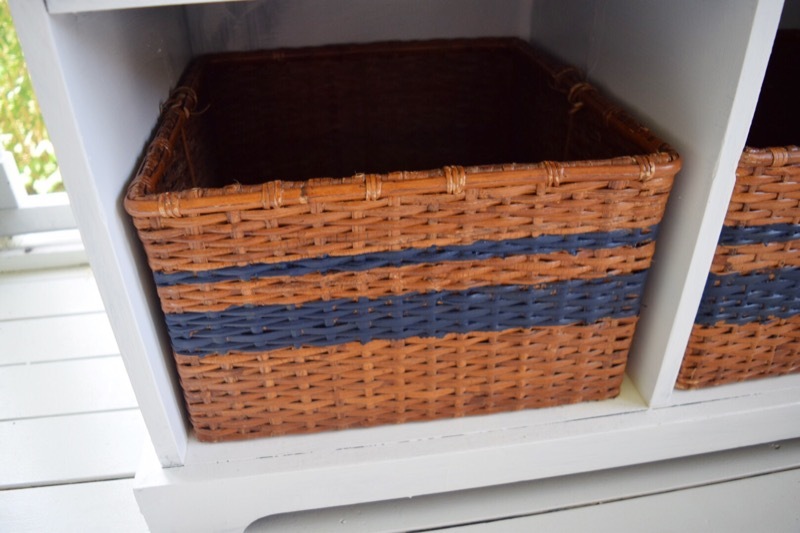 I fell in love with the baskets my friend Bre from Rooms for Rent painted for her kids’ room. You can see that awesome project here. & now for the fun part! 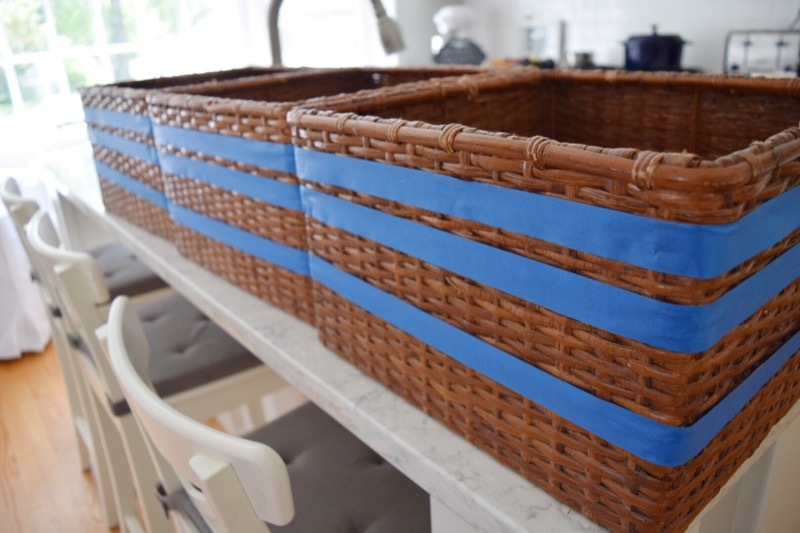 I had to re tape one to try to get the stripe to look a little more straight, not easy on a basket! I love how it came out! No more scratches or bite marks visible! I let it dry on my deck before I brought it in. I went out to do some grocery shopping and while I was gone it started to rain! I came home and the bench had little water bubbles on it! The sealer worked!! 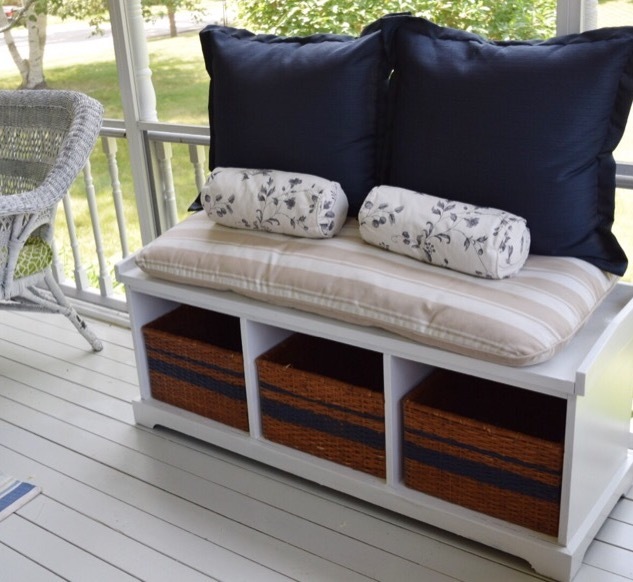 Now to bring it on the porch and make it look pretty! I found the cushion at a yard sale, it is almost just the right size. It will do perfectly. 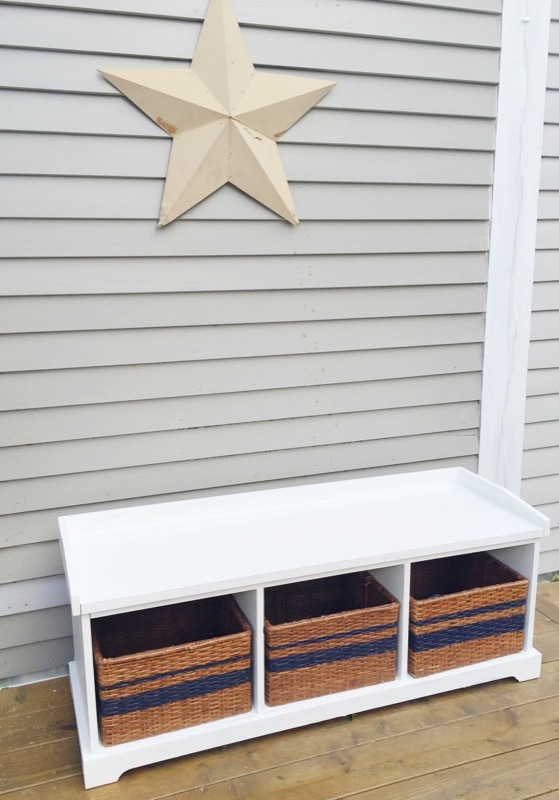 My Pottery Barn make-over worked! I can’t wait to show you my whole porch! I am in the middle of redecorating it. This up cycle so helped to brighten up the space!! 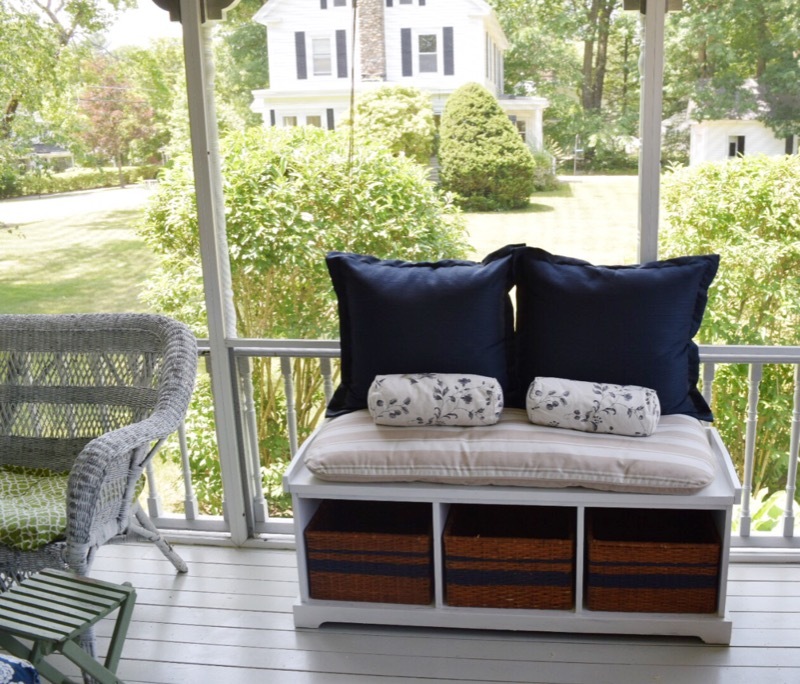 Look for my post on the porch coming soon! Thank you so much, Sarra! Wow, Kellie! I LOVE this!! What a great idea and it turned out so well. Thanks for the inspiration! ?